tennis player from the United States. McEnroe won seven Grand Slam singles titles — three at Wimbledon and four at the U.S. Open — nine Grand Slam men's doubles titles, and one Grand Slam mixed doubles title. He is remembered for his shot-making artistry and supreme volleying; for his matches against Bjorn Borg; for his fiery on-court temperament, which frequently landed him in trouble with umpires and tennis authorities; and for the catchphrase "You cannot be serious!" directed toward an umpire during a match at Wimbledon in 1981. Clearly, he was more concerned with his remarkable skills than strategic public relations. He was inducted into the International Tennis Hall of Fame in 1999. McEnroe's game combined shot-making artistry, deft volleys, and a fast, attacking style of play. His sharp reflexes enabled him to return the biggest serves and passing shots masterfully, and the variety, delicacy, and quickness of his play delighted crowds. 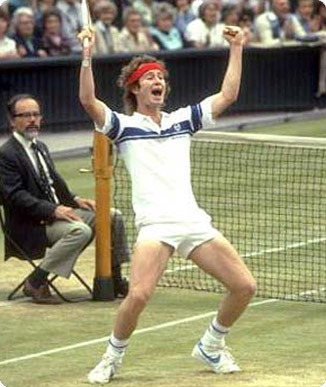 But McEnroe also quickly became known for his competitive fire and volatile temper. Verbal outbursts seemed to be a key way in which he motivated himself to battle through tough situations during matches, but this frequently got him into trouble. If you loved how John McEnroe played with his famous net plays and would like to find out how to improve and revolutionize your game, Brent Abel is highly recommended. Go to his site, WebTennis.net.